You are here: HomenextTopicsnextViews of the city: images & opinionsnextMystery photos of Brighton and HovenextWhich CVA factory was this? Here's wishing you a happy retirement! Click on the photograph to open a large version in a new window. I really like this retirement photo from Gil Percy’s collection, everyone smiling and so happy. I imagine the date is around the late 1950s although I am not exactly sure. The occasion is at one of the CVA factories, and the senior manager, wishing the gentleman a happy retirement, is Percy Steer. Behind Mr Steer is the Proof Printing Press, manufactured in Brighton by CVA under licence to American company Vandercook & Sons during the 1950s. At which of the CVA factories the retirement photo was taken is a mystery to me, I don’t recognise it. Eaton Road is the most likely, as it was mainly used for assembly work. Personally I want it to be the factory in Upper St. James’s Street, as I am not aware of the existence of any photos of that factory. However unless the photo is older than my estimation it seems unlikely, as it closed in 1952. I know there are a number of ex CVA mybrightonandhove surfers around the world, who may know the answer? Both Keith and I think its No 2 Factory in Hollingbury. Also the chap retiring is Joe Prince, behind him to the left is George Petit, and to his right is Bert Back with the grubby overall. Fred Harwood is to Bert’s right behind the young apprentice. At the back, behind the handshake, to the right of the little guy is Joe Wesley. Hi Gil and Keith, it’s nice to have some names to go with the faces on this photo of CVA history. I know I’m doubting the thoughts of two stalwarts of CVA/K&T/KTM in Gil and Keith, but I’m inclined to think it’s the Kemp Town factory. Looking through the windows of the factory I can see slate roofs of what looks like Victorian houses. I lived in Kemp Town in the early 60’s and I remember the derelict buildings of Warwick Street and Laurel Row. The old factory was set behind the parade of shops on Upper St James’s St and accessed through an archway from that street. Those shops were two story properties; to me it looks like the slate roofs of those Victorian buildings. I don’t think the Eaton Road or Hollingbury factories had that type of slate roofed buildings in the close surrounding area. There again I may be wrong, but that’s what makes this website so interesting, lets hope one of the youngsters in this photo makes a comment ‘I know where it is because I’m in the photograph’. I don’t think its No 2 factory in Hollingbury for the following reasons, 1) Through the window can be seen the tiles of a pitched roof, that were not at the Hollingbury factory. 2) The window is somewhat like that of those at Hollingbury, however the ones at Hollingbury had many more sections. I have photos of Hollingbury and the windows are different. 3) The Hollingbury No 2 factory had a very high ceiling and was light and airy, this factory is not! The man in the dark jumper is my Dad George Roberts of 101 Moulsecoomb way. He worked for CVA at Lewes Rd. and Hollingbury for about 30 yrs. My brother Clive and I used to go to their Christmas party when we where kids. Good old Dad died when he was 92 bless him. Hi Mary. My auntie and uncle were Mary and George, Mary was my dads sister. His name was Thomas (Tucker) Fulker. How are you all? Hi Thomas, so we are cousins? All my brothers and sisters are all still going strong, thank God. I’m sitting here with Billy and Tony reminiscing about the old times. Was your mum called Amy? Thank you Peter for sending the links to the CVA website. It has made interesting reading, in particular details about No. 2 factory Hollingbury. It has brought back memories from that period of my life. Also, thank you for the two photos showing the Vandercook proof presses. I have for so long now, been searching for something to confirm that presses were built in Brighton. Many articles have been published about the history of British-built proofing presses but nothing has been written about the presses that were built at CVA and this has given me the opportunity to put this right. As to which factory, Vandercook Proof presses were only ever built at No. 2 Hollingbury. I joined CVA in 1952 and initially worked in the machine shop on a Holbrook lathe but quite quickly moved to the assembly shop. At that time we were working on fixtures for the car industry, I believe for Ford and assemblies for Molins cigarette equipment. We were told a new contract under the name of Vandercook was being processed as many components were being stacked in the assembly area. Over the years we assembled three models. The No. 4 which can be seen behind Mr Steer in the above picture. The larger model, the 219 and the 05 galley press. Also part of the contract were the Vandercook test blocks. They measured 2″ long x 1″ wide x .918″ in height (type height). Machined to within tenths of a thou, then packed in special felt lined boxes, 50 per box. They were used to check the quality of the cylinder packing on the very large letterpress printing presses at that time. Using carbon tissue as a medium rather than ink to show any inaccuracies in the cylinder packing which was then corrected. I enjoyed my time at CVA, for me it was one of life’s stepping stones. I left CVA when the contract finished in 1958 and joined Pre Press (London) Ltd, the company that had arranged the original contract on behalf of Vandercook & Sons USA. Despite the years, I am still involved with this equipment. Towards the end of last year I came across a model 219 in a plant in the north of the country. It had not been used for many years and was in a sorry state. But I felt it could be brought back to life and it is now installed at a university in their letterpress workshop. It is being used to teach present day graphic design students the art of letterpress printing to produce their designs from wood letter, metal type and lino blocks. Incidentally it had a significant serial No. 1066B. Built at No.2. It still had the original CVA motor fitted, regrettably I was unable to save the motor but saved the attached CVA tag. Good luck with your book Basil! Hi Basil. I have the audited accounts and Chairman’s reports for most years of the 1950s. The report for 1951 shows a photo of the Vandercook Proof Press, as one of the many CVA manufactured products. No 2 Factory was not open in 1951, it is mentioned in the report that “the new factory (No 2) is currently being built to our own design”. In the report for year ending 31 Dec 1953, it states that “the Engineering Group previously located in Kemp Town, have now been re-located to the new factory at Hollingbury”. So it’s clear that the Vandercook Press was manufactured before 1952, definitely in 1951 (perhaps earlier, I don’t have the reports for 1948/49/50) and definitely not at Hollingbury because it was not open! Also, the photo shown above is not the Hollingbury No 2 Factory, the windows are incorrect. The No 2 Factory had a huge vaulted roof, and the windows are huge arched, I have many photos of them and they are not those in the photo. 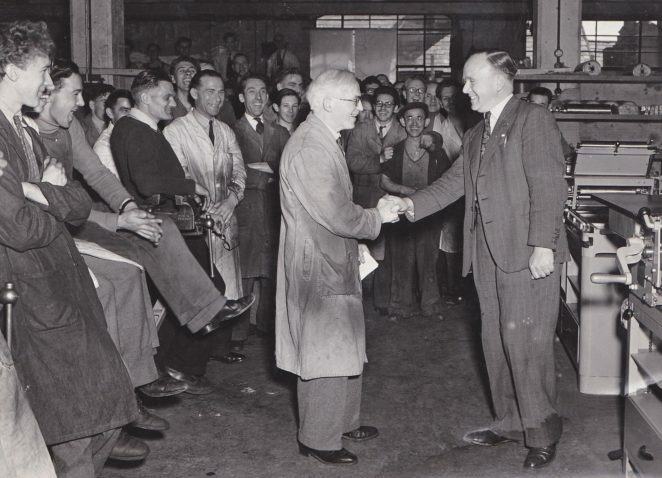 My best guess is the photo was taken in the Kemp Town factory, before 1952/53!